On September 11th 2001, Jim Betancourt, stood in his middle school classroom watching America fall under attack and determined himself that he would never allow for it to happen again. That year, after the attacks, he was encouraged by his teachers to pursue a future career in Law; and while he did have an interest in law, he decided that the best way to protect this country would be by having a career in politics. The 9 years since the attacks, he has managed to work himself up to an impressive career in the field. While he is still in college; he has attended political conventions, leadership seminars, worked on a state representative campaign, and has accumulated many awards over the years. He also has a blog called The Conservative Austinite. He has found, through the years in his vast experience, the need for common sense and conservative principles that can carry this country forward for the many generations yet to come. In his years working on campaigns, he has managed to take pride in the fact that he only works for candidates that agree with at least 3/4ths of what he believes in. Currently, he manages the Stephen Casey Campaign for Texas State House District 52 in Williamson County. 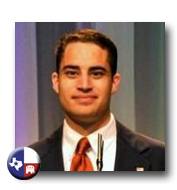 His staff is primarily made up of both college Republicans and young Republicans from around the State of Texas, both of which Betancourt is a member of. Residing in Austin, TX he lives with his parents and brother. Besides politics, Betancourt enjoys running, video games, and online networking. He is also a two-term Commander of the Sons of the American Legion for Travis Post 76 in Austin, Texas. He attends Glad Tidings Assemblies of God Church in Austin and will soon be attending Texas State University. You can follow Jim Betancourt on Twitter.